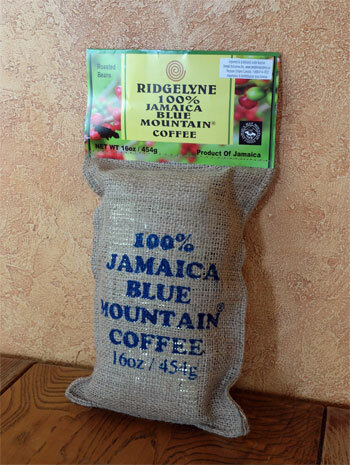 Deeply satisfying Jamaica Blue Mountain Coffee from Ridgelyne. First, a big thank you to David O’Connor for sending us some of his Ridgelyne 100% Blue Mountain Coffee. We reviewed their coffee before, a few years ago. But as David reminded me, each year’s crop is a little different. In addition, their roaster has been working on the dark roast, making it just a little bit darker. As you may already know, Jamaica Blue Mountain coffee is one of the best, most sought after and expensive coffees in the world. It is grown at high altitudes in the Blue Mountains of Jamaica, within unique microclimates, and growing in a rich, volcanic soil. 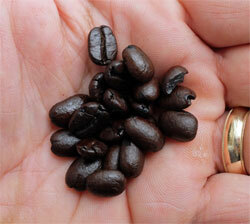 The growing area is small, which is one of the reasons why 100% Blue Mountain coffee is always in short supply. It’s worth pointing out that a lot of “Blue Mountain Coffee” you’ll find for sale is not 100%. Far from it. It’s often a blend of about 20% Blue Mountain coffee, with the rest coming from other growing regions, or even other countries. Not the same coffee at all! What you need to look is this precise description: "Jamaica Blue Mountain®" coffee. 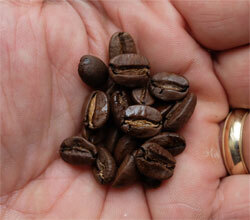 Anyway, David sent us three bags of coffee to try – a dark roast, a medium roast and a small bag of peaberry coffee. He suggested we mix the peaberry and the medium roast in a 40/60 proportion. And that’s exactly what we did. As a side note, I brewed the first cup with a drip brewer, but really wasn’t happy with the result. We got a much better cup with our French press. Yes, this tasted noticeably darker than the last batch we tried. That made us a little nervous, as the darker the roast, the more likely it is that you’ll lose some of the more subtle flavors. But the roaster had his finger on the button just right. This is a strong, rich coffee, but also sweet and full in the mouth. There is a hint of nuts, and a deep caramel flavor that could perhaps be better described as molasses. Not too much…just a touch. You also get a hint of nuts and a dry touch of fruit. It’s not a citrus fruit taste…more like a dry, subtle touch of banana. I'm not suggesting it tastes like banana, but that it has the same slightly dry and delicate sweetness. But best of all, the flavors combine nicely with the touch of the bitterness you look for in a dark roast, and hold their taste consistently from the first sip to that lingering aftertaste. As you would expect, with the medium roast the bitterness is dialed back, and the molasses reverts to caramel. This is a milder, sweeter and more gentle brew, with the same hits of nuts and fruit. And, as with most quality 100% Blue Mountain coffees, it fills the whole mouth beautifully, and the taste holds and lingers well after the last sip. We had never tried this combination before. David had warned us that the peaberry alone wouldn’t give us the best taste, but was interesting when combined with the regular, medium roast beans. It’s not as sweet as the medium roast alone, but you still get that touch of caramel, and a little more fruit this time. Just a touch of citrus. 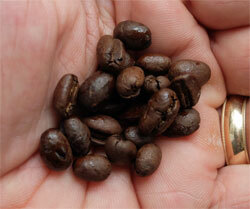 Using the peaberry beans is a great way to experiment with the flavors of Blue Mountain coffee. You play around with the proportions and find just the taste and balance you like. As we anticipated, these are excellent roasts of a truly wonderful coffee. We look forward to enjoying the rest of the bags!